At The Floating Rib, Anna (Finola Hughes) was reading a news article about Peter (Wes Ramsey) still being at large when Felicia (Kristina Wagner) arrived. She was looking for Liesl (Kathleen Gati) so they could discuss Maxie’s (Kristen Storms) baby shower. Felicia offered her friend her support and told Anna that she did the best she could (giving up her son) under the circumstances. When Finn (Michael Easton) arrived, Felicia smiles that she was right about them as a couple and congratulated them on their relationship. Meanwhile at the cabin, Liesl read the new P.K Sinclair novel. Calling Peter a compelling writer, Liesl told her captive that keeping him alive was becoming much more interesting. Liesl decided that she wanted Peter to write two more books: One his confession about Anna to destroy her and the other as a tribute to Nathan. But Peter reminds that as she hasn’t fed him, there’s no way he could write one, much less two books. Liesl decides her will dictate and she’ll write his words. And if the books become bestsellers, she’d let him live. Jordan (Vinessa Antoine) talked with Maxie about her friendship with Peter and urges her not to blame herself for not seeing who Peter really was. 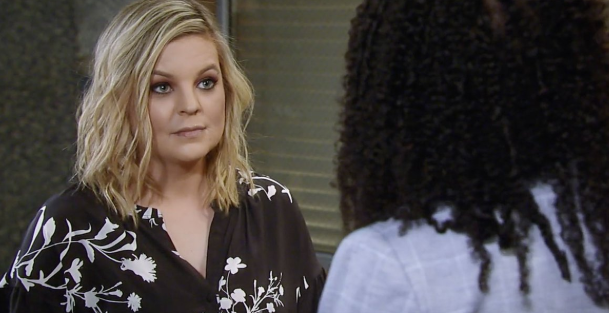 Maxie worries how she’ll be able to raise her son without Nathan. Jordan tells her that if she needs her, Maxie can call any time, twenty-four seven. Nina (Michelle Stafford) accused Valentin (James Patrick Stuart) of trying to blackmail her with what she did to Cassandra in order to get her (Nina) back. Sam (Kelly Monaco) and Curtis (Donnell Turner) were able to convince D.A. Dawson (Elizabeth Hendricksen) they were PIs hired by the PCPD to find Henrik Faison. Jason (Steve Burton) gave Carly a burner phone; he told her to hide it and only use it for emergencies. Jason feared that Kevin would blow the whistle on him. After he clocked off work, Jason went to The Floating Rib and met Anna. They came to terms about holding guns on each other at Pier 55. Once Jason left, Finn encouraged Anna to go see Robin. Anna got in a car and asked the driver to take her to the airport. She didn’t see that he had a gun in the front seat next to him. After Liesl left the cabin and met with Felicia at Nina’s office, she told her she would now being handling the baby shower planning. Mary Pat (Patricia Bethune) confronted Mr. Morgan and fired Jason from his janitor job at Ferncliff. Proud parents Drew (Billy Miller) and Kim (Tamara Braun) celebrated Oscar (Garren Stitt) winning the Ashbery Award for Excellent in Writing. Josslyn (Eden McCoy) to experienced pangs of sadness and missing her mother as Carly (Laura Wright). Josslyn gave Oscar a compass and the remainder of the cologne (Morgan’s cologne that fell out of Nelle’s bag). Oscar’s comment about no one from Joss’ family coming to the award’s ceremony upset her and she ran off. Jason (Steve Burton) went to see Sonny (Maurice Benard) and told him that he was fired from his janitorial job at Ferncliff. Jason gave Sonny an overview of Mary Pat (Patricia Bethune) and how she has been tormenting Carly. Meanwhile, Carly was almost caught by Mary Pat while attempting to use the burner phone. Thinking quickly, she told the nurse that she was hiding the diary that Dr. Collins encouraged her to keep. Mary Pat taunted Carly that her friend Jason Morgan would no longer be around to look after her. She warned Carly not to engage with the patient next door. We later saw Mary Pat giving the patient a shot for disobeying her and making noise. Chase (Josh Swichard) and Dante (Dominic Zamprogna) worked together to get the goods on Nelle (Chloe Lanier), who continued to lie to Michael (Chad Duell) that Chase has been harassing her. Josslyn told Sonny and Michael about winning the scholar athlete award. After Sonny leaves, Jason comforted Josslyn and assured her that her mother is the strongest person he knows. While she was writing a letter telling Carly how much she missed her, Nelle arrived and asks whether she’s seen the missing cologne bottle. Carly (Laura Wright) and Sonny (Maurice Benard) had a reunion at Ferncliff. Sonny encouraged Carly to be strong and do what she needed in order to get released. Carly asked about her children, wanting Sonny to tell Josslyn (Eden McCoy) she loved her, and Michael to stay clear of Nelle (Chloe Lanier). Sonny paid orderly Rupert to look after Carly while she was in Ferncliff. After Sonny left, the patient next door began making noise again by typing morse code on the wall. Carly used the burner phone Jason gave her and downloaded a morse code app that indicated the patient was sending out an S.O.S. At Kelly’s, Chase (Josh Swichard) rehashed their history with Nelle and told Nelle that she’d never fit in with the rich Quartermaine and Corinthos families, reminding her that they (he and Nelle) were alike. When she saw Michael (Chad Duell) enter, Nelle pretended for his benefit that the police detective was still harassing her. Michael entered a threatened to call the commissioner and file a restraining order against Detective Chase. At Charlie’s Bar, Alexis (Nancy Grahan) offered Julian (William de Vry) the deed to her house her brought her in order to give him closure. He encouraged her to keep it. General Hospital’s new hard line against harassment included having notices posted throughout the building. Francesca (Celesta DeAstis) almost told Michael about Dr. Bensch’s sexual harassment of her but didn’t have the courage. She later recounted her tale for Kiki (Hayley Erin) and Alexis at Charlie’s Bar. Griffin (Matt Cohen) couldn’t get his night with Kiki out of his mind as he worked out on a punching bag. Franco (Roger Hogwarth) and Ava (Maura West) joined forces, vowing to make Dr. Bensch pay if the court doesn’t. Sonny came to the Quartermaine mansion to deliver Carly’s message to Michael. Sonny found Chase working out on the punching bag. Chase told Sonny that they were fighting on the same side. As part of his plan to convince her that he was on her side, Michael proposed to Nelle. 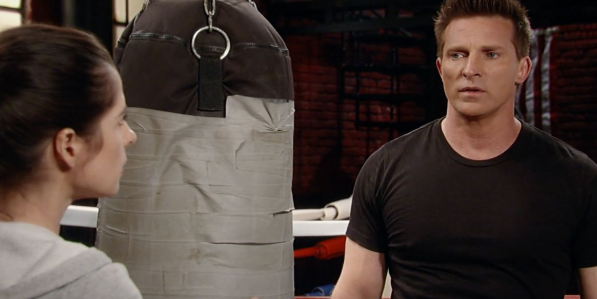 Sam (Kelly Monaco) was working out on the punching bag when Jason (Steve Burton) arrived at the gym. She spotted Jason by holding the bag. Jason said he really needed to punch something then told Sam about what Carly (Laura Wright) was going through at Ferncliff. He feared that he was unsuccessful in talking Carly down and was afraid she’d do something out of desperation. Jason considered breaking Carly out of Ferncliff and running off to Canada, but Sam reminded that Carly would never leave her children. And if they were caught, Jason would be shipped off to Pentonville and Carly back to Ferncliff. His only choice would be proving Carly’s innocence. Elizabeth (Rebecca Herbst) invited Drew (Billy Miller) to her and Franco (Roger Hogwarth) wedding. At Charlie’s Pub, Alexis (Nancy Grahan) urged Dr. Bensch (James DePaiva) to get an attorney. Bensch sought out Scott Baldwin (Kin Shriner) to represent him. Dante (Dominic Zamprogna) told Lulu (Emme Rylan) he was offered a transfer to work on a special WSB task force. After he left, a tearful Lulu recalled when they first met. Ava (Maura West) and Franco talked about options to kill Dr. Bensch. But after learning Bensch had asked him to represent him and Baldwin had turned him down, Ava suggested Scott take the case and lose it…plus she’d pay him double his fee. Scott returned back to Dr. Bensch and told him he’d be his lawyer. Since they were going to be parents, Michael asked Nelle to marry him. Although skeptical at first, Nelle accepted the proposal after Michael convinced her he never stopped loving her. Sam offered to help Jason get his hand on the Noodle Buddha chinese food menu Carly insisted had the message telling her to go to the cemetery. Sam and Jason believed Nelle (Chloe Lanier) has used invisible ink to make the note disappeared and Spinelli (Bradford Anderson) could help prove it. Sam (Kelly Monaco) assured Jason (Steve Burton) she’d be careful lifting the Noodle Buddha menu from the PCPD. Jason met with Spinelli (Bradford Anderson) and told him about he (Jason) getting fired from Ferncliff and his concern that a cornered and betrayed Carly (Laura Wright) would do something rash. Meanwhile, Kevin (Jon Lindstrom) explained to Carly why he told Mary Pat (Patricia Behune) about Jason. Carly shared with Kevin her history with Jason. Kevin urged her not to engage with the patient next door. 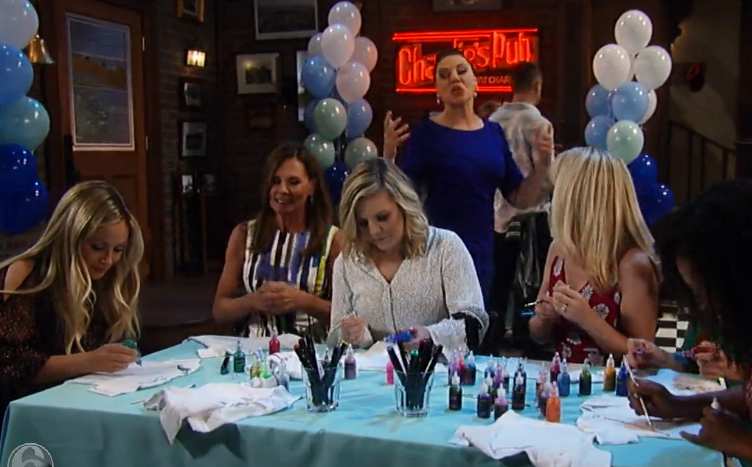 While Maxie (Kristen Storms) and her baby shower guests awaited co-hostess Nina (Michelle Stafford) and Liesl (Kathleen Gati), Nina told her aunt they couldn’t leave Peter (Wes Ramsey) alone in the cabin because he had a fever and couldn’t tell what was real. After Nina and Liesl left for a shower, Peter had a hallucination of Maxie in which she told him that she was there to watch him suffer. Peter told Maxie it was easy being her friend and how she made him think about someone other than himself and would let go and let himself die if it would ease her pain. Spinelli was surprised when Sam entered and told him she had gone into the PI business with Curtis. Later, Spinelli was able to make the invisible ink, visible and uncover Nelle’s (Chloe Lanier) note. Franco (Roger Hogwarth) asked Drew (Billy Miller) to be his best man and Drew accepted. Elizabeth talked about Terry, her best friend in middle school when she lived in Boulder. She explains to Drew and Franco (who was jealous) that she and the boy were inseparable. At Maxie’s baby shower, Sam overheared Julian (William deVry) asking Liesl about her time in the woods and then watch edsuspiciously while Nina and Liesl talked. After Drew and Franco left, Elizabeth got a surprised when Terry arrived at her door because he is now a she.